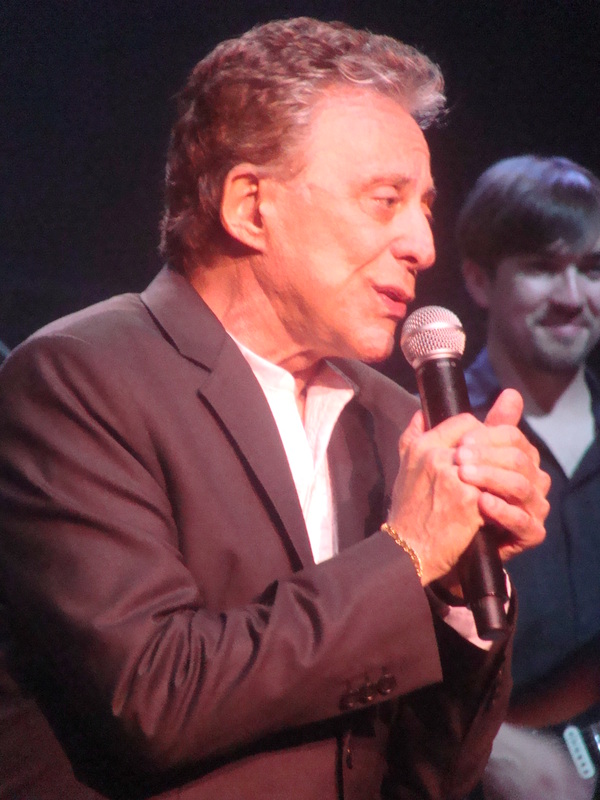 Frankie Valli is one of music’s great survivors. Whilst many of the original generation that brought us rock and roll music are no longer around – Elvis Presley, Johnny Cash, Roy Orbison, Buddy Holly, Eddie Cochran – Valli continues to make music and not only to survive but to excel at what he does. On Tuesday, he played to a packed house at the Royal Albert Hall, London, which included rock guitarist, Jimmy Page, and the man who plays Valli on a stage of the West End and the director who will immortalise his life and music on the silver screen. Now that’s some audience. 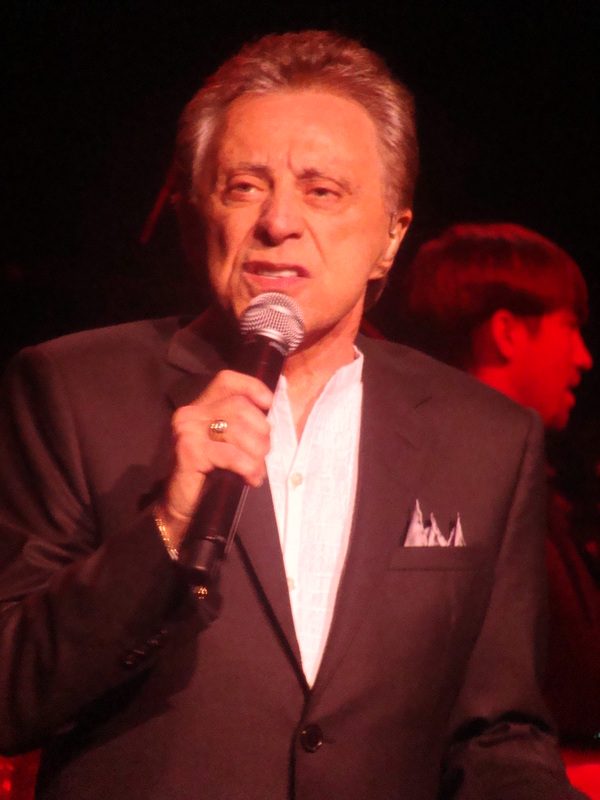 And because of the success of the West End and Broadway jukebox musical “Jersey Boys”, Valli is playing to larger audiences on his current UK tour than he was on his last British visit some 18 years ago. Not only that, having added four backing vocalists to his fourteen strong touring band, his voice is more confident than it was then and he hits every note he attempts – whether it requires his legendary falsetto or his rich and romantic real voice. The show tonight opens with the 1978 Barry Gibb composition “Grease” from the film of the same name which was a huge hit for Valli on the original soundtrack but most of the performance are songs written or co-written by Frankie’s Seasons partner, Bob Gaudio, who though he retired from performing in the early-70s continues to produce Frankie and the Seasons’ recordings right up to the current day. Right from the beginning the band are steered by musical director and keyboardist, Robby Robinson who has worked with the Four Seasons and their various lineups since joining the band in 1980. There is a good time, party-feel to the whole evening, not least because virtually every song is instantly recognisable and when originally recorded depended on Mr Valli’s voice which sounds amazingly unchanged. There are songs where the arrangement has been changed to match the needs of the advancing years but this is something that has been done with great skill and never sounds like compromise but is a way to let that famous voice flourish in its autumnal years. After “Grease” comes Dawn (Go Away) and then a quartet of hits from later in the Sixties – Save it for Me, Tell It to the Rain, the recently-revived Beggin’ and the Cole Porter classic, I’ve Got You Under My Skin. Tell it to the Rain with its synthesised thunder and right-on-the-money guitar solo is one of the picks of the night but neither the excellent musicianship on display nor the harmony singers are allowed to dominate – this is Frankie’s night. After a brief sortie back to an earlier hit for “Stay” (with great backing vocals and ever-so-slightly-camp dance movements from the backing quartet), we are reminded of some of the Four Seasons hits from the Seventies. The ballads, My Eyes Adored you and Fallen Angel are the sandwich in which the filler is an extended workout for Swearin’ to God which loses the female vocal from the original but gains a long instrumental improvisation which allows Frankie and his co-singers a little respite. Fallen Angel is sung amazingly strongly for a man of Valli’s vintage and is one of my highlights of the show. In recent years, Mr Valli recorded an album of some of the other music that was happening in the Sixties and having chosen to cover mostly ballads, he titled it “Romancing the Sixties”. The album wasn’t his biggest solo success and some critics didn’t warm to it but I think it holds up well. Tonight he showcased the album by performing “Call Me”, “Let it Be Me”, “Spanish Harlem” and a medley of “My Girl” and the Rascals hit “Groovin’”. All shape up well in the live setting and are worthy of inclusion. Frankie seems conscious just how many of his hits were embraced enthusiastically in Britain whilst been overlooked in his major market of the U.S.A.. After a short interval he revisits “The Night” which hit here in ’75 after doing nothing on the other side of the pond on its original release a couple of years before. There’s also “Silence is Golden”, another one of those songs which Gaudio wrote for the 4 Seasons but became a UK hit for another band when the depth of great songs come from the team of Crewe / Gaudio meant that for Seasons it was only a b-side leaving it available for The Tremeloes to take it to their hearts and enjoy a number one hit. “Working My Way Back to You” and “Opus 17” give opportunity for the 4 singers to join Valli centre-stage and these are followed by a low-key “Harmony Perfect Harmony”, from the “Who Loves You” album, perhaps the only song in the set which might not be immediately recognisable to the more casual concertgoer. It is that “Who Loves You” album which is concentrated upon next with its two huge hits, the title track, and “December ’63 (Oh What a Night)” being the next to be performed. The latter gives our singing-dancing quartet the opportunity to show their chops on lead vocals as they take turns to replace Gerry Polci’s lines from the original without a stumble. One of the greatest mistakes of British musical history must be the way that the UK audience embraced Andy Williams’ cover of “Can’t Take My Eyes Off You” rather than Valli’s infinitely superior rendering which gave him a monster hit in the States. It is that song which is let loose next and even the last lingering doubter in the audience was now a fully-fledged member of the party. Ultimately, it seems the Seasons had too many good songs for one night and we find ourselves in medley territory for the closers and the encore. 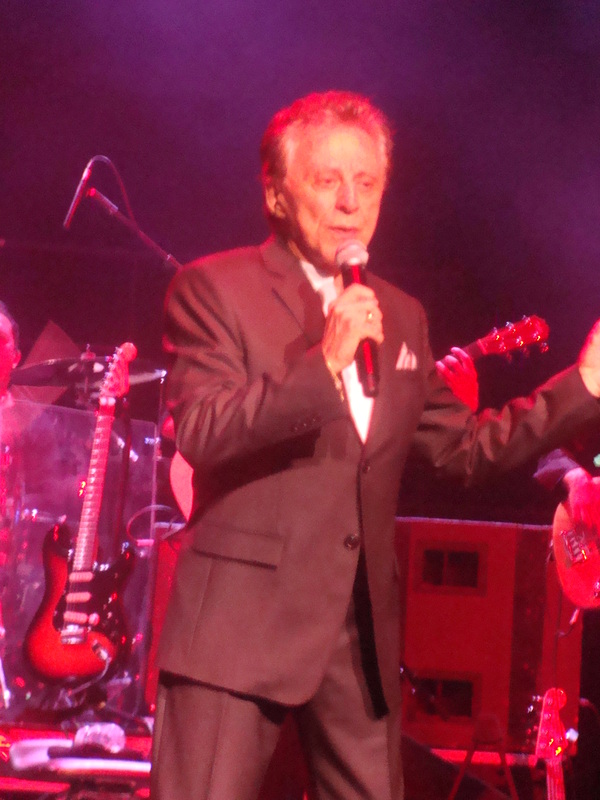 “Sherry”, “Walk Like A Man”, “Big Girls Don’t Cry”, “Bye Bye Baby”, “Rag Doll” and “Let’s Hang On” find everybody on their feet and Frankie thanking the audience for an overwhelming welcome back. 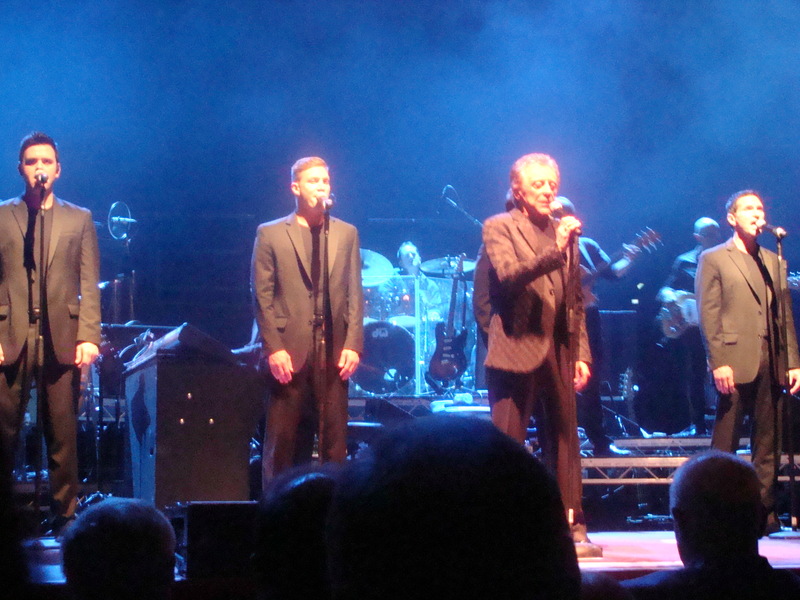 In the mid-90s when Frankie Valli and the 4 Seasons last toured the UK, both the band and Valli’s voice were, it seemed past their best, and ready for mothballing. The history of the band is infinitely more complicated than “Jersey Boys” would have you believe (it seems each few years have their own version of the 4 Seasons) and this new ensemble has given new vigour to the performance and most importantly a new lease of life to Valli and that voice. If you have opportunity to catch them on this go around, I recommend you do. It is a night you will treasure. 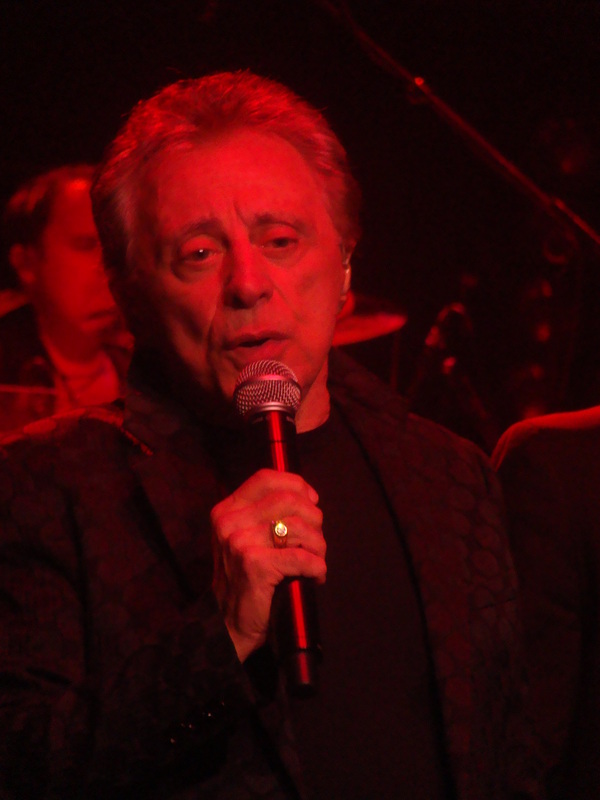 This entry was posted in live show, music and tagged 4 Seasons, concert, Four Seasons, frankie valli, Frankie Valli and the Four Seasons, live show, music by twilightdawning. Bookmark the permalink. That’s a beautiful review of the show!